"Tracey, how in the world are we going to get across the river?" I asked looking down at the ice on that cold January day. "Walk," she replied as she took off with determined 14-year-old strides across 100 yards of the frozen (I hoped) river. "Come on," she called to me as I hesitated on the bank of snow. I headed onto the ice; I stood as tall as I could; I swung my arms; I kept my head up; I did all of this to try to hide my terror from Tracey. A month earlier she had told me I was a "wuss" and a "weinie," because I didn't want to ride in an open 6 wheeler when it was minus 20 degrees. While crossing the frozen Cheyenne River, I didn't want to be bothered with more teeny-bopper teasing. Tracey Walker has been crossing this river every day since kindergarten to get to her one-room school house which lies 2 miles south of the river. She is now in the eighth grade, and next year she will have to drive 40 miles on a gravel road to get to high school. Her older sister, Amy, is a senior there and has been "boarding out" for her high school years. Boarding out means that families must find a place for the students to stay in town during the week. Obviously, this is a major factor in their lives. It is always planned that the students will stay Monday-Friday only; however, the reality is that the roads are often impassable, and the students have to spend weekends in their boarding home. Tracey and Amy Walker will probably be the last two students to walk this river to get to school. Another piece of history will fade into the past. I had come to visit this little school with 7 students as I wanted to articulate the differences and similarities between rural and urban education. I thought I would ask Tracey leading questions like: "So, tell me what you are reading at school? Do you have a school library? What do you get to do during science? Do you and your classmates work together on projects?" Instead, I asked: "What in the world do you do in the spring when the ice starts to melt?" 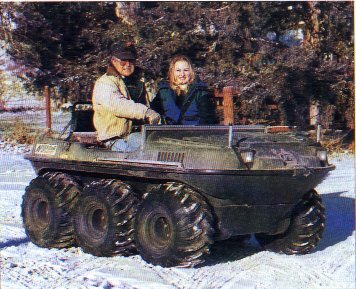 When Tracey Walker can't walk across the frozen Cheyenne River, her trip to school sometimes involves fording the river with her father Larry in the amphibious Argo. "Sometimes, we use the 4 -wheeler; the Argo (see Note 1); the 4X4 pick-up; the tractor; the john-boat; and, sometimes we use horses. But, a lot of the year we can walk or wade across except when we have to use planks to cover the ice and water, " she matter-a-factly listed her means of transportation as she scrambled up the bank of snow on the south side of the frozen river. "What? Planks?," I asked as I hurried to catch up with her. "Yes, planks to connect the pieces of ice. Don't worry, we have life jackets which we hang on that tree when we get to the other side. Sometimes we had to use a rope to tie Amy and me together, and my dad went ahead to check where the river was safest. But, the worst time was when we were on horseback, and my horse fell into a hole in the river and had to swim. There was water coming over the saddle," she explained to me. On the other side of the river, we found a little blue car which Tracey's family leaves there for her. Amy leaves her little car here, too, when she comes and goes on Monday mornings and Friday nights. As we approached the car (unlocked, of course), Tracey put on her gloves and immediately began to clean all the snow, which had fallen since last night, off the front window. We jumped in and drove towards Deep Creek School. I am able to visit Deep Creek because I am on sabbatical from a state university in California where it seemed that every conversation for the past year had revolved around languages, literacies, and cultures. I had been involved daily with all the great debates: How do you teach reading -- whole to parts or parts to whole? Which is better -- bilingual or English-only? What is the future of education - public, private, charter, home schools? Pedagogy and politics consumed my life. Now, here I was just trying to get to a little one-room school safely. It was not yet 8 a.m. In California I spent a lot of time talking about pedagogy, the interaction between teaching and learning, and critical pedagogy (see Note 2), the study of pedagogy which examines the hidden (and, not so hidden) social, cultural, historical, and political influences which affect teaching and learning. As we crossed that river on the Northern Plains, I actually thought about the first pedagogs: the young Greek tutors who walked the Roman boys to school and taught as they went. Our word, pedagogy, comes from the Greek word, paido which means boy. The Greek word changed as it moved into Latin and became pede, means foot (as in the Greek boys who walked and taught the Roman boys). In Spanish it changed some more and became pie, meaning foot. In English this all became our word, pedagogy, which continues to evolve. We come from a tradition which taught that pedagogy was akin to the science of teaching. For example, I used to think that pedagogy was about me, teaching. When I started my first teaching job on the mainline of Philadelphia, I thought pedagogy was: I will teach, and they will learn. At least that is what I thought until I started teaching, and the students started teaching me. Today our understandings of pedagogy are not just about teachers, teaching. Pedagogy is a far more interactive and dynamic word than it used to be. Now, pedagogy includes the human interactions which happen between teaching and learning; between teachers and students; between teachers and students and the entire community. Pedagogy takes place when people join together to share knowledge and generate new knowledge. Here we were: two pedagogs, walking across the river as Tracey taught Joan about prairie pedagogy. 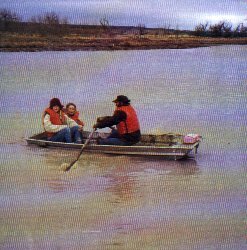 Larry Walker ferries his daughters, Amy and Tracey across the Cheyenne River to Deep Creek School in Pennington County. Imagine a typical day in a school near you. What do you see? What do you hear? What do you feel? In what follows I will share the story of a typical day for Tracey at Deep Creek Elementary near the Cheyenne River in south central South Dakota. This is the story of the prairie pedagogy which is rapidly fading from our national experience: the one-room school house. In an old, cold Jeep, I left our ranch on a cold, foggy day to drive the 20 miles on a dirt road. Tracey's family told me the trip would take 30 minutes; it took 50. It was not snowing, but it was snowy. I felt surrounded by white. The horizon linked the sky and land into a steel-gray foggy vision of cold. The prairies were covered with snow and patches of autumn wheat-colored grasses fighting to stand straight in hopes of a glimpse of sun. No sun would warm the prairies today. I drove from north to south; from the flat rolling hills of the prairies, to the plateaus or mesas which border the Cheyenne River. At these edges, the plateaus fell away into cedar-covered canyons, ledges, and steep inclines which the prairie people call "the breaks." It seemed to me an apt name because they do break the seemingly endless flat land of the Northern Plains. En route, to school I saw 6 deer, 75 antelope bunched into two groups, one coyote, and several hawks: the red-tailed, the Swainson, and the Harris hawk. I saw cows hunkered down in draws for protection. In one isolated pasture, I saw a lonely horse huddled on the south side of a large round bale of hay to find protection from the stiff north wind. When I arrived at the very top of the mesa which looked down on top of the frozen Cheyenne River, I looked east and west and saw only miles of the ribbon of ice. As far as the eye can see, I looked south where I knew the Badlands were somewhere hidden in the bluish gray cold. Suddenly, a white pickup emerged from the icy fog. Larry, Tracey's Dad, had come to offer me a ride down the ice-covered hill. Larry grew up here and had crossed this same river to get to school. We drove down the steep hill ( 15% degree of pitch and 1/2 mile straight down; see Note 3) which is the lane to the ranch headquarters and picked up Tracey for the short ride to the river. As we approached the river, we were surrounded by tall barren cottonwood trees and 200 wild turkeys. Larry dropped us off, and Tracey and I crossed the river. 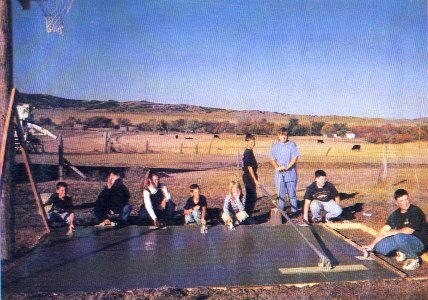 In my multiple experiences with rural and urban education in several states, as student, teacher, and parent, I have observed that many in urban education feel they have nothing in common with rural education, and that many in rural education feel they have nothing in common with urban education. That has not been my experience. The lessons to be learned about teaching and learning (pedagogy) are mutually informative. As we approached Deep Creek, I saw a stereotypical Norman-Rockwell-looking one-room white school house buried among the white background of the prairies. Swings and a slide were outside for the kids to use during recess. Only one car was parked in front of the school; it belonged to Amy, the teacher. I could see no other buildings in any direction: no towns; no ranches; no buildings. Tracey and I entered the door and walked into a room which is known here as a mud room. It is an entry way for jackets, mittens, boots, scarves. I could see that the other students had placed everything where it belonged; the jackets were on hooks on the wall; the hats, gloves, and scarves safely stored in the sleeves; and, the boots were neatly standing below each jacket. A stairwell to the right led to the basement which is considered a luxury because of the warmth it provides, the indoor bathroom, and ample room for storage. Tracey and I took the stairs to the left which led up half a flight to a door which led to the classroom. A large thermos of drinking water was on the table outside the door with each student's cup and/or glass beside it -- indicating that the water from the well was good enough for the bathroom, but was not good enough to drink. Water on the prairies is a the ultimate luxury. I found a desk and chair in the back of the room and began to look around. I wanted to sit and sense; I wanted to note my first impression. Peace and purpose: that is what I sensed. Next I realized that we were all safe here; these kids were happy, and they were actively involved with their own learning. Happily, I settled back to learn, too. Before long, I had learned that the kids were able to talk with each other whenever it was meaningful to them. I noticed that they leaned across the aisle and helped each other. Questions and answers continued to link all the students - without interrupting any of them. After sitting quietly and focusing on the culture of the classroom, I looked around to see what could be learned from the walls. First, I found the Class Rules: Be kind. Be quiet. Be learning. Why would anyone ever need other rules, I wondered? Second, I found the student's individual New Year's resolutions for 1999. Although they were as unique as the individual students, they were all joined by one theme: Each of the resolutions reflected a determination to learn more. After this I spotted two computers and two printers with a schedule for students' use. I could see that one of the computers was state-of-the art. The written schedule indicated that each child was scheduled for free writing each week. I had never met Amy, the teacher, before today. However, I had a sense about her. A week earlier I had called her on a Sunday afternoon to arrange this visit. To my joy and her annoyance, my call came just as she was in the midst of a mystery novel. This told me a lot. It's true: I have a bias for teachers who love to read. I suspect that their love of reading is infectious; I have a hunch that teachers who read and talk about their reading will have students who love to read, too. Therefore, I was very eager to see the library at Deep Creek School. The book shelf/library was right beside the computer; I got up and examined the books and was pleased to see many high-interest, chapter books for all levels. The books were well-used: a very revealing pedagogical practice. Kids who read a lot, learn a lot. I wondered if any of these kids were true flashlight kids (see Note 4) - did their parents find them in a dark bedroom, covers over their heads, reading their favorite books? I sure hope so, as this tells me more than most standardized test can hope to predict. For the next hour and one half, Amy continued to call the individual grades to her semi-circle desk to work with her. The fifth graders (David and Kyle) worked on homophones (bear/bare; new/knew; too/two; buy/by; see/sea) with Amy. I think they got it. As I watched, I remembered teaching this same lesson to groups of 30 and 35 students, every 45 minutes all day on a class rotation cycle when I was a teacher in Arizona. I'm not sure they got it. The 8th graders (Tracey and Allen) had just finished a lesson on descriptive language. 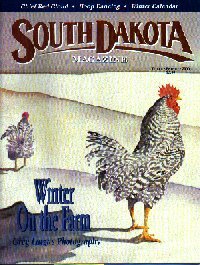 Allen (8th grade) wrote: On a cold day, about 40 degree F. below zero, the animals are holed up under trees; in holes in the ground; in big deep washouts; and, the cats are in the barn. The dog is in her doghouse, cuddled up in the blankets. Tracey (8th grade) wrote: On cold winter days when the wind howls and the snow blows, the cows stand in the pasture with humped backs and purple noses. Our cats bundle one on top of each other to keep warm. Our dogs jump with delight when in sight of snow. All the pets jump when we open the door to the house thinking they might get in. Other students shared their language lessons with me. Samantha (2nd grade) wrote: In the winter the prairie is white. In the spring it is green and colorful In the summer it is as green as sea weed. In the fall it's orange, yellow, and brown. Zac (4th grade) wrote: When we made the basketball court, we put boards together, we dug a long, wide hole, then we scattered rocks in the hole. Next, we put cement on the rocks; we smoothed it and let it dry. Finally, we got to play on it. Kyle (5th grade) wrote: Our life here is fun because we do chores and do whatever we want. I like riding horses, riding bikes, playing football, fishing, hunting, and petting horses. David (5th grade) wrote: In winter the prairies are white, and the trees' branches are white. In spring the grass turns green, and the birds are out singing. In the summertime, the grass turns brown. The sun comes out and we start to make hay bales. Then there's fall when the leaves start to fall off the trees. Raking leaves into piles and running and jumping in them is always fun. My favorite season is spring; that's when the cows start to have calves. There's a lot of riding horses then. That's the best part. Zane (7th grade) wrote: We have a lot of animals out here like hawks, bald eagles, coyotes, cows, horses, dogs, cats, bobcats, prairie dogs, raccoons, porcupines, turkeys, grouse, pheasants, and vultures. Lisa (7th grade) wrote: On a cold day, we put on our coveralls, coats, hats, gloves, scarves, and overshoes and go feed the animals. The horses and cows will be in a bunch with snow on their backs; our chickens will be in the chicken house. The pigs will be sleeping in their little barn. Our cats and dogs will be in the barn in the straw pile. At 10 a.m. it was time for recess. Amy asked for a show of hands: who wanted to go outside for recess? Everyone's hand went up, except mine. The students started to get ready to go out for recess. I just learned another rule: Majority rules. After recess, the students came in and took out their own little snack, and each immediately began working on their individual math lessons. The students of Deep Creek Elementary School planned and constructed their own basketball court - education in action. Time for lunch. The students got their lunch boxes, heated their Tupperware meals in the microwave which was in the back of the room, and Amy asked them to ask me questions. They wanted to know about my writing and how it related to their writing. We talked about the editing process, and how we always just keep writing and trying to improve our writing. Nothing is ever perfect; we just keep writing. Kyle reminded me to use the five senses when I was choosing descriptive words for this article. On Wednesdays, school ends at midday so the kids can go to town, Wall, and take part in extra-curricular activities with kids from other country schools. Two family cars arrived and picked up the 7 kids to go drive the 20 miles to town. After the students left, Amy drove me to the river. She turned her car around in the snow and dirt and returned to school. I was all alone on the river bank. There was not a person within miles. And, there was the frozen ribbon of ice. I looked at it and thought about the fast moving currents underneath. I was raised on the Missouri River and know how deceiving ice can be. I thought about Tracey who has done (or attempted to do it) this every day for her K-8 school experience. I remember thinking that if the ice should crack or break, there is not a soul who could hear me - much less help me. I stepped out on the ice where each step forward was a victory in courage for me. I worried that the weight of my fear would make me heavier. It didn't, and I arrived safely to the other side and felt jubilant. I retraced my steps through the barren cottonwoods. I couldn't find the turkeys who must have been roosting high in the trees by midday. I started up the hill where my jeep was parked on top of the mesa. I was wearing heaving, serious snow boots, a snow suit, and carrying two book bags. Immediately, I realized that it was steeper and farther than this morning when I had a ride down. Relatively and aerobically speaking, I am in fairly good shape. In fact, for a grammie, I am in good shape as I have run and walked for years. However, I was exhausted when I topped the hill and saw my jeep surrounded by cows. I shooed them away and tried to catch my breath. On my drive back to the ranch, I watched more eagles and more antelope. I stopped twice en route to write in my journal for fear than I would forget something. I saw the horse again; now he was on the east side of the hay as the wind was coming from the west. He had eaten enough of the hay bale during the day so that he had less protection. I arrived home: exhausted and thrilled. What did I learn during my day at Deep Creek School? I learned the importance of four pedagogical principles: meaningful, purposeful, relevant, and respectful (see Note 4): a never-fail approach to good teaching and learning. How do these four pedagogical principles turn into practice in Deep Creek? I saw and heard of many examples, however, I will list only one example of each. First, meaningful turns into classroom practice, as daily lessons which are so much like one-on-one tutoring and/or experiential learning that even homophones can become meaningful. Second, purpose is woven into practice in all that I saw and observed that day: Samantha, David, and Kyle each needed to pass specific math concepts before they could move on to the next level; they were deeply involved with timing, taking, and scoring their own level tests. Tracey was captured by the story of Anne Frank and was reading voraciously on her own. Seventh grade student, Lisa, explained to me that if she doesn't understand something, she can ask the teacher to reteach her the lesson. Zack, Zane, and Allen were connecting with the world as they took their individual turns at the new computer. Third, relevant turns into practice as Amy and the students planned and implemented a school/community science, math, language project which resulted in a new concrete basketball court. From a dream to digging and hauling and smoothing concrete to a rousing game of basketball, the students did it all. Fourth, respect turns into practice as students are completely responsible for the maintenance of the classroom. Respect for property which the students take care of is a lived experience every day. If what we do with students is meaningful; if it is purposeful; if it is relevant to their lives; and, if it is respectful, we all learn more. I found this to be true with 5-year olds; 15-year olds; and 55-year olds. As I lay in my warm bed that night, I thought of Tracey who had a gymnastic practice tonight in town. I remember she told her Dad she would get home at 10 p.m. I thought of the two families driving back to Deep Creek Elementary School in the cold and dark. I thought of Tracey's little blue car sitting outside the one-room school waiting for her and thought about how cold it would be to start her car. I envisioned her driving on the dirt the 2 miles down to the river in the dark. I realized that she would have to cross that river tonight. However, I know that Larry will be there waiting for her to drive her back home. Good teaching and learning (pedagogy) doesn't just take place in the classroom. It is a community affair. It is a family affair. 1. Argo: Judy, Tracey's Mom had described it to me as an old-fashioned bathtub with 6 wheels which has made the river crossing much easier during the spring and fall when the river is a moving mixture of ice and water. I have seen it and will guess that it could float for a little awhile. Judy said that it is helpful to have a little sense of adventure and a lot of faith when crossing the river in the Argo. Having the Argo means that Tracey gets to school more often. Last year she missed school 33 days and still carried an A average. She has extra copies of every textbook at home. 2. More is available on this in my book, Critical Pedagogy: Notes from the Real World (2000), ISBN 0-8013-3257-5, from Allyn Bacon Longman's Publishers; 1-800-852-8024; 800-278-3525. 3. At 6 or 7 degree of pitch, main roads will have signs telling large trucks to shift down to a lower gear. 5. Meaningful, purposeful, relevant, and respectful. I have learned this on multiple occasions from Ken and Yetta Goodman of the University of Arizona. I never go to a class, nor presentation, nor inservice without carrying these four pedagogical principles safely tucked away in my brain. When things begin to go wrong with teaching and learning (pedagogy) for me, I reflect on these four principles and usually can discern what we need to do differently.